Last month's self assignment was about taking a fresh look at common household items. It's amazing what you can find to photograph that's just lying around the house. We want to congratulate both the winners and all those who participated. Thanks to our sponsor, FujiFilm, the winner receives 20 rolls of the Fuji professional film of their choice. The runners-up receive 10 rolls of the Fuji professional film of their choice. Winners are notified by email. This image is actually one of a series of images that Melissa shot for her "bathroom series" which fit in perfectly with the idea of taking a fresh look at household items. The idea she said came from a case of cabin fever while she was home with a cold. The original image was created using her Nikon D100 digital camera and Tamron 28-300mm lens set at 185mm (f32, ISO 400). She used a Nikon SB28DX flash and set her camera's white balance to "flash". Once she had the original image she "hand tinted" the individual Q-tips "using the hue brush mode with little opacity". 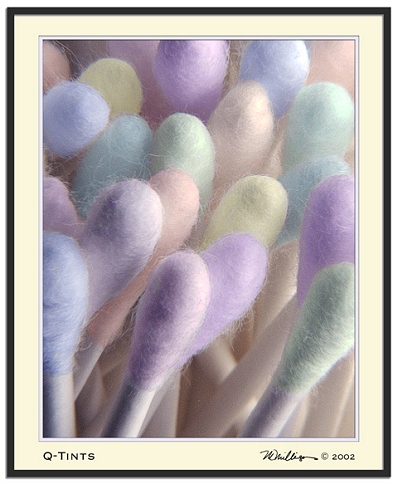 The result looks like a traditional hand tinted photograph and is definitely a different take on the common Q-tip! Jim tells us "When I was looking for items to photograph I found this basketball on the floor of my sons room. The light was hitting it perfectly so I took a few shots. I like the way the gold letters are reflected the sun." To take this photo Jim used his Minolta XTSI and Minolta 24-105 zoom lens shooting on Kodak Gold 100 and scanning on a Umax scanner. 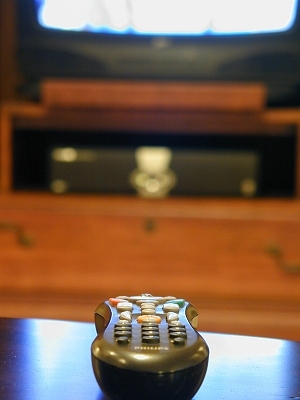 "I caught the Tivo remote watching it's favorite show on TV." To sneak up on the Tivo remote Greg used his Olympus C-2020 Digital Camera set to ISO 400. This final image was cropped from the original.